I expected the panel discussion to be 6 or so people sitting at a table having questions thrown at them. What we saw was vastly different, and a true crystallization of what is good at Disney. 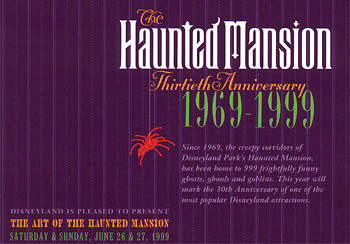 The stage was lit in black and purple light, and as a prelude, while guests were milling about and drinking their free beverage, an organist played Disney songs rearranged into eerie, minor keys in the style of the Haunted Mansion, ending with "Grim Grinning Ghosts." The curtain opened and on stage were candelabras, a row of ornate overstuffed chairs and rolling fog... it looked just like a room out of the Haunted Mansion. Disneyland Resort President Cynthia Harriss rose out of the floor wearing a black cape and introduced the event, and the crowd very enthusiastically applauded once she introduced herself. (This is the first time I have seen her. What a good debut! Not at all like seeing the controversial Paul Pressler stumble through the new Tomorrowland opening last year). 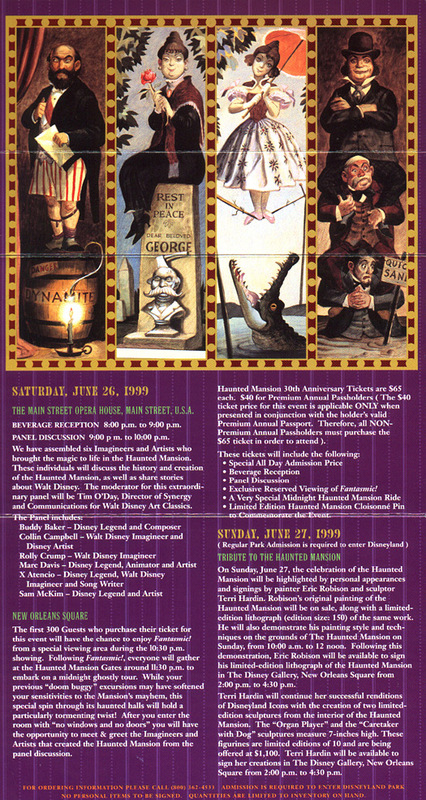 Harris then yielded to Madame Leota, who floated in through the rolling fog behind the six assorted chairs (two of which looked like electric chairs) and introduced the five guests: Marc Davis, Rolly Crump, "X" Atencio, Sam McKim, and Buddy Baker (WED artist Collin Campbell was sick, and did not attend). Disney Legends are introduced at Disneyland's 30th Anniversary Haunted Mansion event by resort president Cynthis Harriss. Suddenly, this guy interrupts the show by walking down the aisle with a lantern. Wait... it's the caretaker from the Mansion! He's looking for his dog. So he gets up on the stage, and is eventually joined by the hitchhiking ghosts and the bride from the attic. They break into a great rendition of Grim Grinning Ghosts and are wheeled offstage in a doombuggy. What a nice touch! The costumes were great -- the ghosts "glowed" in the stage light, and the bride had a red beating heart. 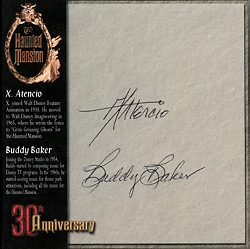 The best part was when the hitchiking ghosts struck the "hitch a ride" pose from the Mansion... the audience went crazy. Tim O'Day from Walt Disney Art Classics was the panel moderator, and he asked a number of prepared questions. They had assembled a multimedia presentation of film clips, audio samples, and still images to complement the discussion, which was a nice touch. The sound, however, was awful in this theatre. The dialog was hard to follow, given the lack of volume and other noise like arriving trains at Toontown station, and the Mulan parade. Rolly Crump was really the most lively interviewee of the bunch. Sam McKim also had some vivid recollections. Tim O'Day started the panel discussion with a question for Marc Davis about the back story (regarding the sea captain and his wife), but the appearance of a still image on the screen immediately changed Mr. Davis's thought process and the question went unanswered. Although it was obvious that Mr. Davis was well along in years, he still had a few witty quips and good recollections about his sight gags developed for the attraction. I was very impressed with the panel. Whoever the directive force was behind setting the event up should be commended. I was expecting a town meeting-style presentation, and we instead enjoyed a Disneyland-caliber production. Ms. Harris' stock certainly rose with guests of the Haunted Mansion event. Extra ghosts and ghouls made the 30th Anniversary Haunted Mansion ride-through an experience to remember. The ride is as wonderful as always, but live ghosts were added, located throughout the ride to personally scare the wits out of selected guests. It's the first time I had to ride this ride defensively - watching my peripheral vision around every corner. The Knight in armor was back, and another ghost got me right before the backwards clock. A couple of ghastly "bridesmaids" were in the attic, and one gave me a personal "Happy Anniversary," which scared and delighted me. I really like the idea of having live ghosts in the mansion. Disneyland should really staff 1 or 2 people all the time for this - I'm sure the Cast Members would really get a kick out of it. First, let it be said that Doombuggies.com is to be congratulated for being invited to cross-promote this event with Disneyland, because the first 200 guests that purchased tickets with a special code given on Doombuggies.com were given a free lithograph of Marvin Davis' front elevation to the Mansion, which was ht of the event.) Also available were a few high-profile sculptures by Terri Hardin, and a bronze sculpture of the Hitchhiking Ghosts. 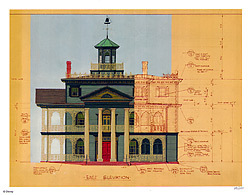 1) Walt Disney from the Disneyland 10th Anniversary Special talking about the Mansion. 2) Unused introductions from Leota and Paul Frees. 3) The Disneyland HM full narration; this seems to include every single sound, thereby stretching the running to almost 23 minutes. Starts with the Horse outside and ends with Little Leota. 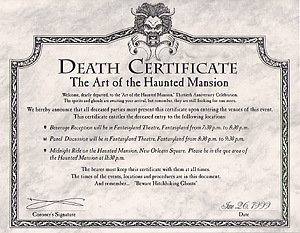 4) The Haunted Mansion at Disney World, samples. 5) The Haunted Mansion at Tokyo Disneyland, samples in Japanese. 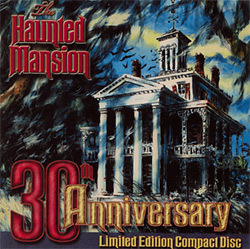 6) The Phantom Manor at Disneyland Paris, an abbreviated soundtrack, containing Vincent Price's original narration. 7) The Genius of Paul Frees - outtakes and narration samples. 12) Breakdown spiels and unload spiels. Disneyland gets a solid "A" for this event. Even though they could have handled the logistics a lot better (with less people allowed to participate as originally planned, and better communication), they really did one heck of a job commemorating such a great attraction. Kudos!